We love to travel. For several years I tagged along with my husband on his business trips to Europe and Asia. With the Internet as my guide, I found fabulous walking tours, bike tours, cooking classes and hidden museums in cities around the world. When Joel retired 4 1/2 years ago, we decided to take at least two big trips a year to continue in the tradition. After all, we don’t know what the future will be because of PD, so we will continue to explore the world as long as we can. We found traveling buddies who did not shy away from our sense of adventure and we are now on our third trip with them in the past three years. We went on Safari in Tanzania, the following year we went to Bangkok, saw the treasures of Angkor Wat and cruised down the Mekong River to Ho Chi Minh City (Saigon) with them. This year, we are eating our way through the Paradors of Northern Spain and Portugal together. The only problem is that I forget that my “PD normal” is not what my “normal” used to be. So I keep pushing myself to do everything on the tour, even though my body is screaming TAKE A BREAK!!!! And at some point, I pay for it. 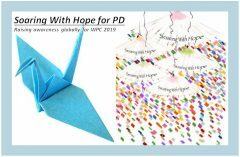 Yes, we walk a lot, but it is not the same as intense exercise for PD. I do some yoga in my room when I can, but there usually isn’t enough space to do it properly. And the food…….We don’t usually eat at home the way we do on these adventures. Yes, those croquettes in Spain are delicious, but they are fried with bechamel sauce inside and they take a toll on our American stomachs. And dinner beginning at 9:30???? When in Spain…….. I have found that there is usually one bad day on these trips. I have learned to stop when necessary and take it easy. Sometimes I just sit and read, or take a Siesta as they do here in Spain. What a great concept the Siesta is! We are in San Sebastion right now, which is on the Atlantic coast of northwest Spain, a few kilometers from France. Stores shut down here between 1-4 pm. 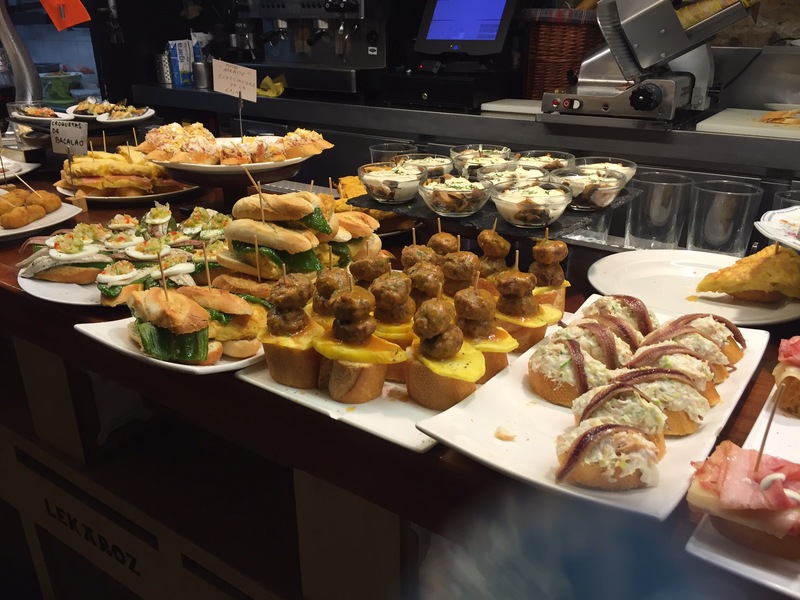 People go to the Pintxos (pronounced Pinchos, the Basque word for tapas) Bars, have something to eat with a little wine, maybe go to the beach or just take a nap. They go back to work totally refreshed and then have a late (and I mean late) dinner. But now that I think about it, there are many days at home where I do exactly that. Since I don’t sleep well at night (thank you PD), a short afternoon respite works well for me to re-energize. When we are traveling and sightseeing, I hate to give up precious time to rest in my hotel room, but it is a small price to pay in order to see the wonders of the world.